Oakland catcher Jonathan Lucroy turned 32 Wednesday. Among his birthday wishes, Lucroy was likely looking for a reversal of Houston’s dominance over his Athletics. But by the time he dug into the box for his first at-bat of the evening the game had already been decided. Evan Gattis and the Astros (44-25) unloaded relentlessly on Paul Blackburn, knocking the Oakland starter out after a career-low 1-1/3 innings, and dropped a seventh defeat on the A’s (34-34) this season in the form of an 13-5 whooping. Blackburn (L, 1-1, 11.05 ERA) was surprisingly strong making his season debut after just 3-2/3 innings of minor league rehab work last Thursday. He looked much more like a starter getting his preseason work done against midseason major leaguers in start No. 2. The 23-year-old Antioch native allowed the first four Astros hitters to reach base, with the most painful of those blows coming in the form of a two-run single by Yuli Gurriel, who entered the game batting a crisp .444 (22-for-45) with runners in scoring position. Two batters later, Gattis collected RBI No. 46 in his 53rd game against the A’s with a sacrifice fly. Blackburn walked off the mound having allowed three runs in the first, though it could have been worse. But Houston was far from done. Five of the six batters he faced in the second reached and Melvin mercifully reeled in his young starter before Gattis could take a second set of swings. No manner of pitching change made by the A’s could prevent Gattis from taking those swings, though. Emilio Pagán was tasked with attempting to cool the human inferno, but his 0-2 center-cut 95-mph heater proved not to be the elixir. For the second time in as many days, Gattis crushed the A’s with a three-run homer (12) to left — RBIs 47, 48 and 49 against Oakland. Adding vinegar to the wound, Marwin Gonzalez unleashed his own jack (5) to make it back-to-back before Pagán put an end to second. Staked to an early lead, the Astros leaned on Gerrit Cole (W, 8-1, 2.40 ERA), who came in leading the league with 124 strikeouts and is, along with teammate Justin Verlander, in the thick of the American League Cy Young race. There was some good news: the A’s have hit Cole better than any other team this season. The drawback: that only means 10 hits in 12-2/3 previous innings — and just four runs. The negative: Oakland hitters had also struck out 21 times against the Astro right-hander. Stephen Piscotty started the A’s attempt at a comeback, tucking a three-run homer (4) over the eight-foot wall in right-center in the fourth. 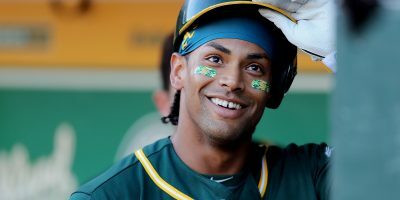 Khris Davis, whose infield single in the fourth ended a 14-at-bat hitless streak with seven strikeouts, kept it going in the sixth with a long opposite-field solo homer (18). Pagán ultimately found a rhythm, striking five in his 2-2/3 innings and holding Houston to the two quick homers. 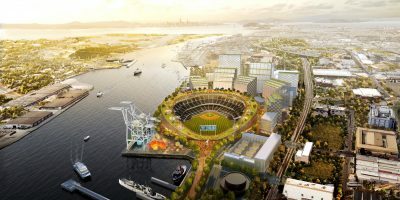 But the damage done against Blackburn, eight hits and eight runs, proved to be too much for the Oakland offense to make up against Cole, who struck out six while allowing six hits, two walks and a season-high fur runs. The A’s gave Oakland fans one last chance to cheer in the ninth, bringing outfielder Jake Smolinski in to pitch the final frame. Things got off to a horrid start for Smolinski, pitching for the first time since his junior year in high school. The first two pitches he threw produced a ringing double by Max Stassi and a tape-measure two-run homer (5) authored by Jake Marisnick, but he cleaned up the mess nicely retiring the next three hitters. 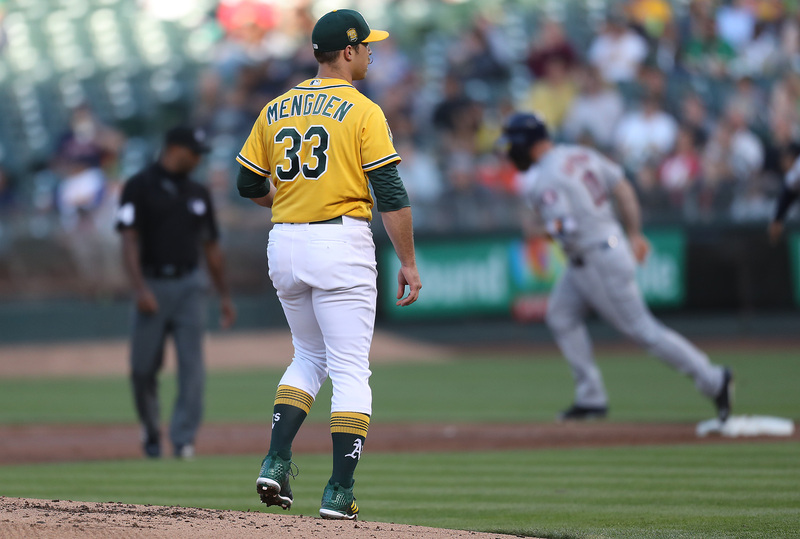 After dropping seven of their first eight meetings with Houston this season, and each of the first two this week, the A’s look to finish their three-game set with the Astros on a high note Thursday afternoon. Houston will send out Justin Verlander (8-2, 1.45 ERA) in search of the sweep. In 17 career starts against the green and gold, Verlander has allowed just 32 runs in 110-1/3 innings (2.61 ERA), going 10-6. Oakland will counter with Frankie Montas (3-0, 1.25 ERA), who has been overpowering in three starts since being recalled from Triple-A Nashville on May 27.